I recently wrote about the foods that I miss from my childhood home, Maui. I decided not to mention an entire genre of delicious hippy cuisine, served up at potlucks, vegetarian and/ or vegan restaurants and health food store lunch counters. This food is a gleeful mash up of vegetarian food from all over the world (but mostly Asia). I’m talking about “samosas” made with rice paper wrappers and baked instead of fried, Macaroni and Cheese with Hijiki Seaweed, and Pad Thai made with equal parts rice noodles and carrots cut into thin ribbons. I decided not to include this kind of food, because I can certainly find delicious health food and the ingredients to make it on the mainland. 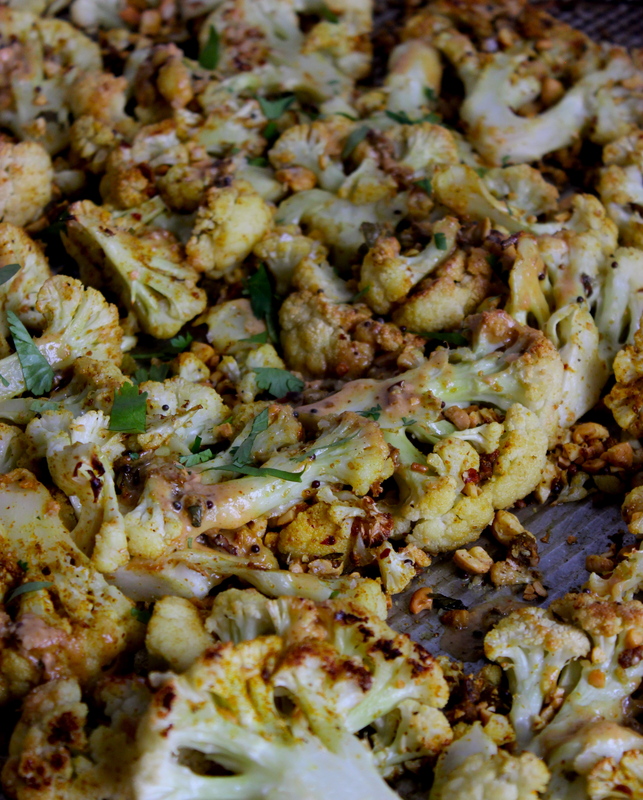 For example, there is no good reason to pine after Cauliflower Roasted with Curry and Cashew Butter, since it is so easy to make. You’ll want to be sure to use a really delicious curry powder. I like Vadouvan (a French/Indian curry powder that includes shallots and garlic) or Madras (spicy!) curry powder, but the stuff sold in any grocery store will work just fine as long as it has not been losing its flavour in the back of your spice cabinet for a few years. In a large baking sheet, toss the sliced cauliflower with 2 Tablespoons of mild oil. Arrange the cauliflower in a single layer and sprinkle with flaky salt. Roast for 20 minutes, then turn the pieces and roast for another 15 minutes. While the cauliflower is roasting, combine the remaining 2 Tablespoons of oil, the cashew butter and a tablespoon or so of the curry powder in a small bowl. Whisk with a fork until it is smooth and then set it aside. When the cauliflower has started to brown on the edges and is just starting to get tender, toss in the rest of the curry and the chopped cashews. Drizzle the cauliflower with the cashew butter mixture and roast it all for another 5 minutes. Serve hot, garnished with chopped cilantro. Leftovers make a nice room temperature lunch. Great recipe. I substituted almond paste – what can I say, that’s what we have here in Israel – and toasted almonds. I also added a bit of cayenne because I’m addicted to spicy food, but it’s obvious to me that the recipe as written would have been at least as delicious. Zev, those sound like delicious adjustments. I will probably do the same some time when I happen to have almonds on hand. Thanks for commenting!